Aging is one of the reasons cited on why people gain weight and have their body shape deteriorate. Well, this is true. When we age, our metabolism slows down. Our habits change as well. We become busier with various aspects in life - work, family and friends. How can we fit in time to work on ourselves? Is that a valid excuse? No. Living is just like any activity. It has to managed. Prioritization must embed in making our life choices. Reduce time spent on less important activities. After all, what could be more important than staying healthy to gain more time living? Start practicing addition by subtraction with Reducin. 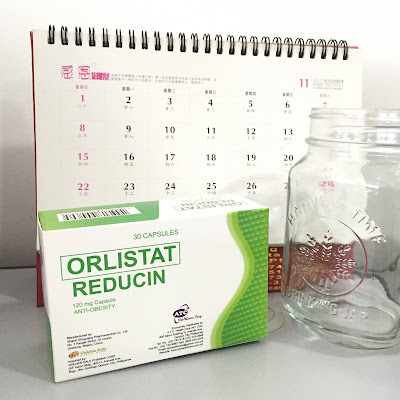 Reducin is a 120mg capsule of Orlistat. It has a gastric and pancreatic lipase inhibitor for obesity management. It works by preventing some of the fat in foods that we eat from absorption. The intestines then excreting these fat through the stool. Use Reducin with proper exercise and low calorie diet. It can help you get back on track and lose all those extra pounds. With Reducin, you'll break free from obesity, diabetes, and other health risks. As your guide, Reducin is not a medicinal drug and should not use to treat the symptoms of any disease. Reducin is 120mg capsules. Take it 3 times a day before every meal, or as instructed by your doctor. If you miss a meal or contains no fat, the dose should omit. The SRP per capsule is P29.50. Get on the right track in weight loss. Reduce as in everyday with the help of Reducin. Reducin is available at Mercury Drug and other leading drugstores nationwide. For more information, please check their Facebook.